With Readly you can read All About History - History of Vampires and thousands of other magazines on your tablet and smartphone. Get access to all with just one subscription. New releases and back issues – all included. The idea that undead beings return to feast upon the living has fascinated cultures and generations for centuries, with different parts of the world sharing their own unique tales of folklore, and with theories evolving as science and medicine have advanced. The characteristics of vampires have always differed from country to country, as well as how they are created, how they are identified, and how ordinary folk can protect themselves against vampires and even destroy them – should they be brave enough. 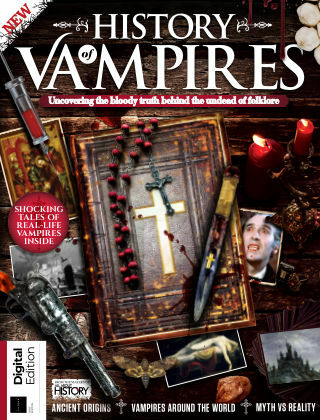 In History of Vampires, uncover the remarkable origins of vampiric beliefs, and examine traditions from around the world, from gruesome tales of blood-drinking Romanian vampires to the Filipino creature that feasts on unborn children. Meet ‘real-life’ vampires, such as Vlad the Impaler and Elizabeth Báthory, and learn about cases from the 19th-century New England Vampire Panic, as well as 20th-century killers. We also explore how the vampires of popular culture contrast those of folklore, and analyse the influences and inspirations in literature and on screen. With all this and much more to sink your teeth into, this is the ultimate companion for anyone with a thirst for vampire knowledge.